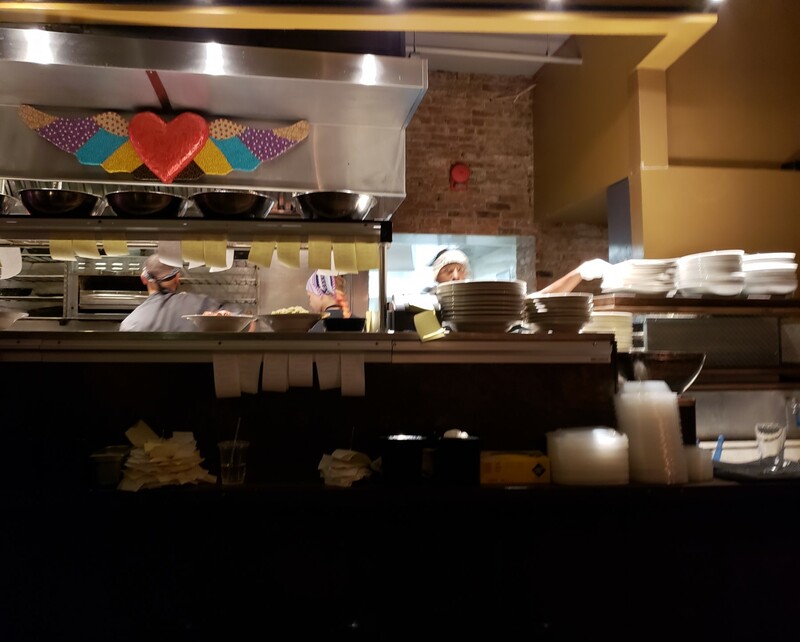 Our 2018 Road Trip, Part 11: Sleepy Time in Syracuse « Midlife Crisis Crossover! 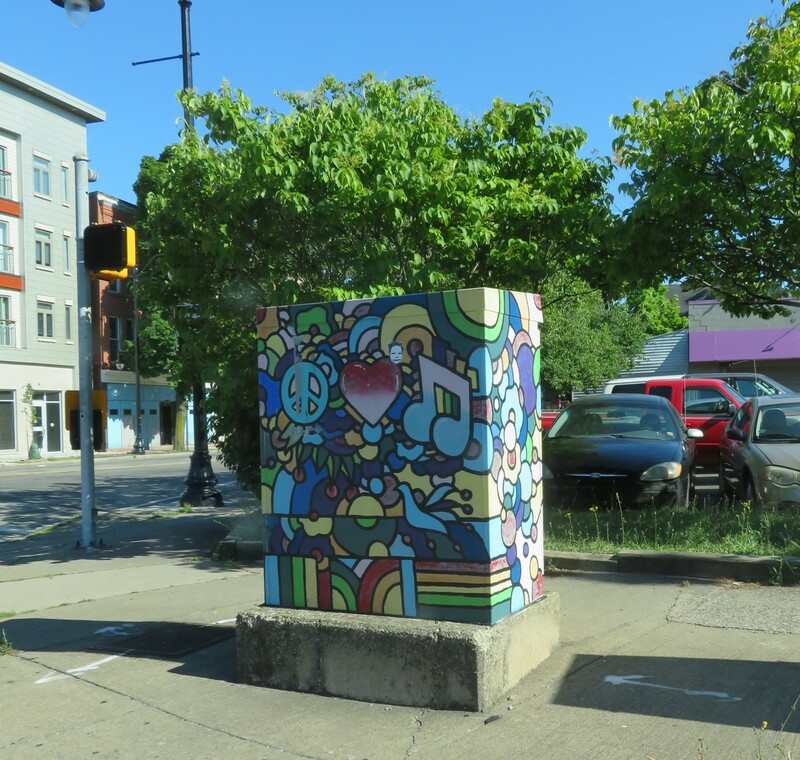 We had no more time for stops in Rochester, but noted a few bonus sights as we drove through their South Wedge neighborhood on our way back to I-90 and another round of tollbooths. 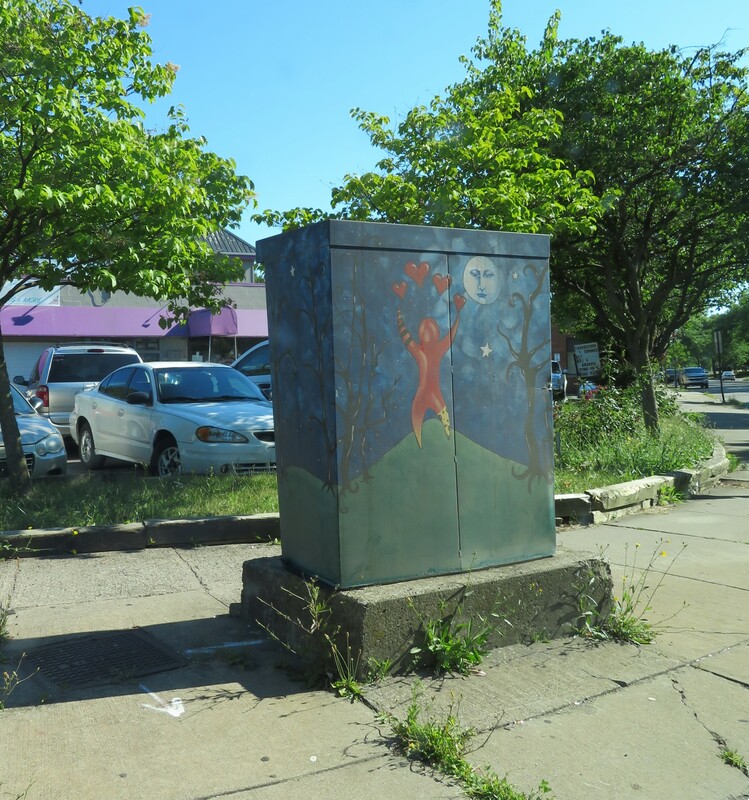 We’ve seen painted electrical boxes in a number of areas, including our own neighborhood. On average, a better graffiti deterrent than stern authority figure expressions. Or “utility boxes” or “traffic boxes” or whatever you call them. At the very least they help distract from the weeds. 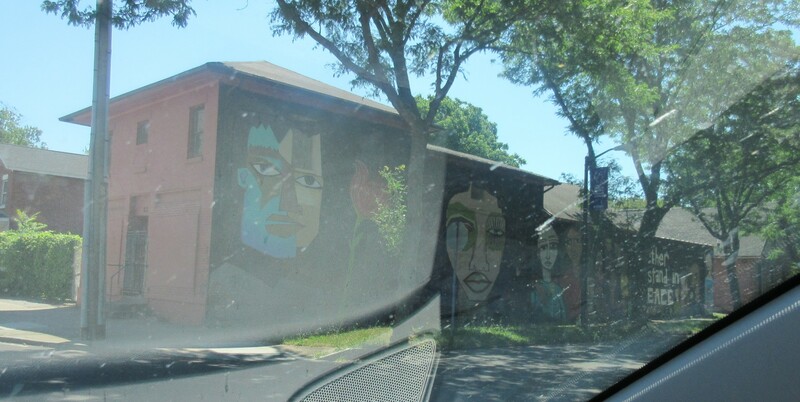 We actually spotted “Together We Stand in Peace”, a mural by local artist Alice Mizrachi, earlier on our way to the Susan B. Anthony House, but it’s still part of Rochester and it thematically fits better here. Feel free to complain about my timeline fudging in the comments below! Ninety minutes east of Rochester was the city of Syracuse. We’d originally chosen it as a stopover for a particular museum Anne wanted to see for its historical significance. We arrived in town well after closing and were let down when we learned it was one of many NY tourist attractions closed Mondays, meaning it was a no-go for the next day. That effectively left us with no specific reason to be here. We figured we’d see what we could make of their downtown anyway. 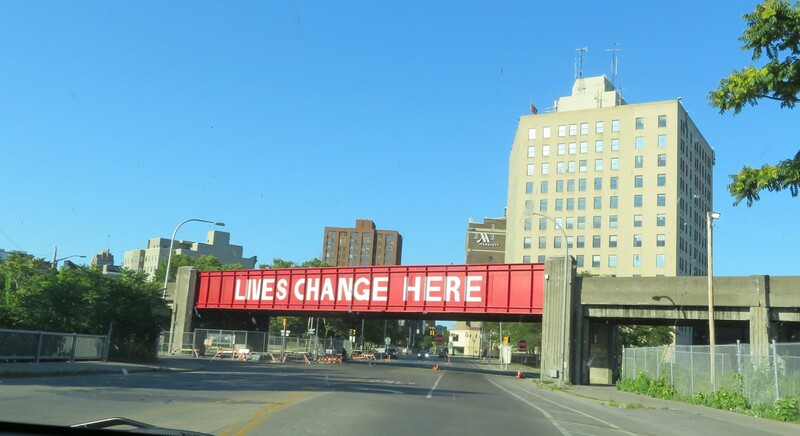 A striking welcome mat of sorts, painted in 2012 by an anti-poverty nonprofit aiming to spur renewal and foster hope in a side of town that needed it. Our arrival dragged on a bit because I had precise directions to our hotel and imprecise notes on their recommended parking garage two blocks southeast. A confluence of one large and very imperfect sign, a few unexpectedly one-way streets, and hours of travel fatigue sent us on a merry chase that ended once I realized my head had spun ’round and my mental compass directions were ninety degrees off. After many minutes and turns we found our way to the garage, mostly empty save a handful of rando teens on bikes riding around and laughing amongst themselves. The surrounding streets were otherwise devoid of life and features. We grabbed all our luggage and trudged the two blocks northwest to the hotel, only to find no visible entrances on the side of the building facing us. Another two-block walk to the opposite end revealed the front door and one disinterested, irrelevant valet. Still bearing several pounds of bags, we had to walk through the doors, up one more flight of stairs, and through the population of a robust Indian wedding party to reach the front desk and check in at last. Thankfully our room for the evening was both spacious and secluded from the festivities. By this time we still hadn’t had dinner. 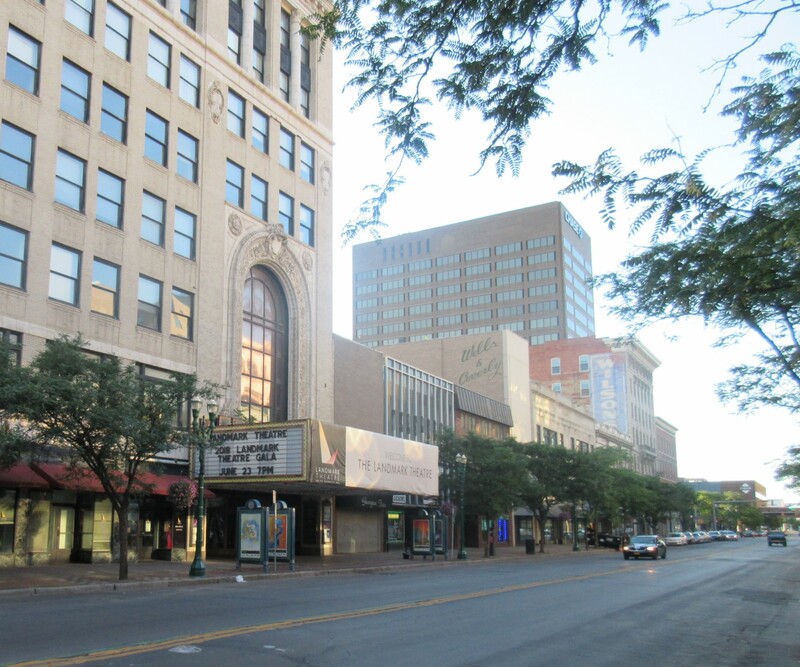 We’d saved our appetites in hopes that downtown Syracuse would surprise us. 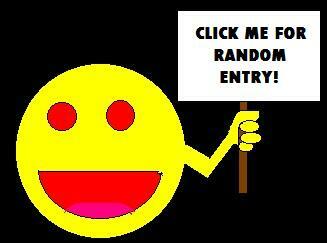 It did in the sense that the options were mostly closed, and the remaining contenders were not next door. Our hotel had three restaurants (only one of them open) plus room service, but the past several minutes’ worth of inconveniences left me disinclined to hand them more of our dollars. We instead scraped up just enough energy within ourselves for one last bit of city exploration before bedtime. The restaurant that spoke most loudly to us from the Google Maps roster was six blocks away, still less of a grind than our Buffalo lunchtime experience. Syracuse on a Sunday night: not a party town. Other pedestrians were scarce as we walked past numerous small storefronts, indie as well as corporate. A stray teen here, a couple there — heartbeats were few and far between around us. Stray litter dotted the concrete landscape — possibly normal ambiance, possibly leftovers from July 4th the week before for all we knew. It might as well have been Main Street of any Midwest town. 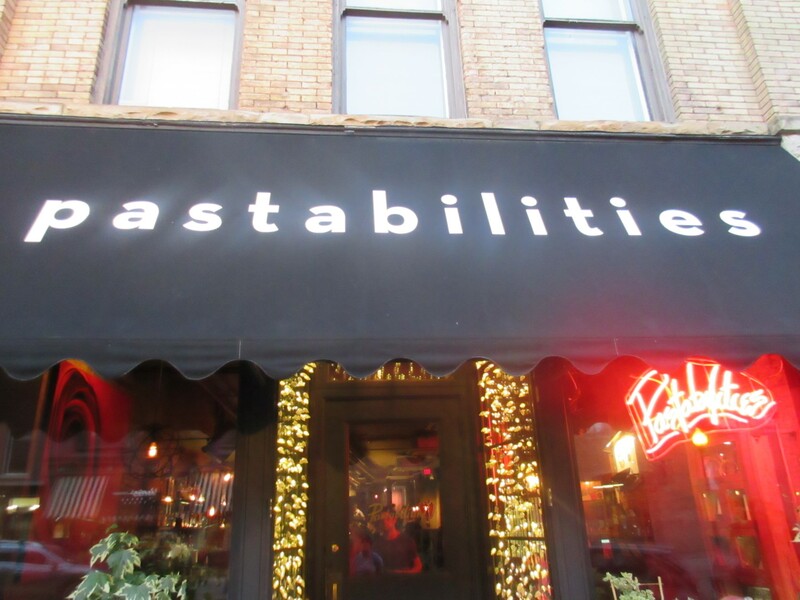 We found signs of life among the well-to-do in the Armory Square neighborhood at Pastabilities, a thirty-year-old Italian eatery As Seen on TV — i.e., in a segment on Guy Fieri’s Diners, Drive-Ins and Dives. Full disclosure: we had no idea about the Guy Fieri connection going in. We only knew we were hungry and I wasn’t settling for Subway. Far as we could tell, Syracuse nightlife existed nowhere but inside Pastabilities, where we waited at least twenty minutes for a table. We were seated next to the kitchen, either as a special treat or as a form of detention for dressing too casually. We never bring formal wear on vacation and appreciate those businesses that don’t mind. Sometimes it’s hard to tell who’s tolerant and who’s snickering at us in the back room. As restaurant veterans in our youth, we knew some of these sights well. 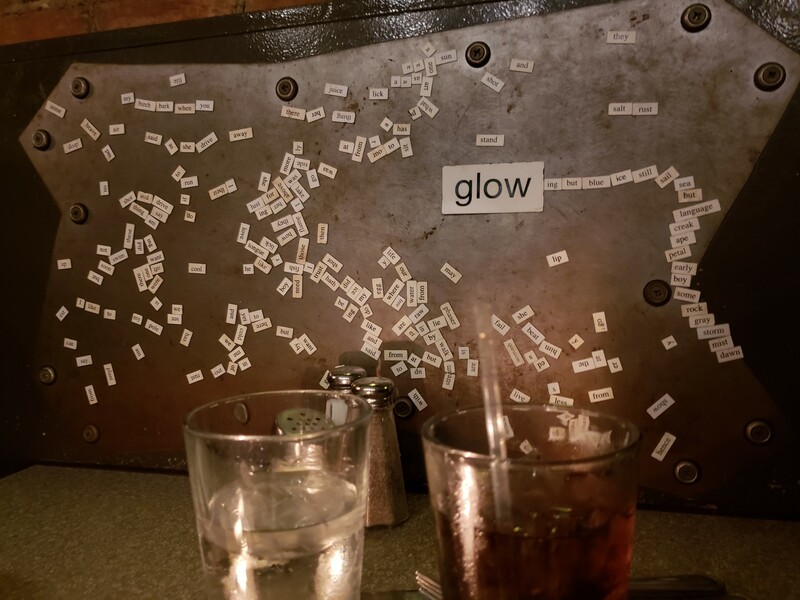 A metal wall covered with word magnets was provided as dinnertime entertainment. I was too tired to form sentences, so please enjoy these works by other strangers. 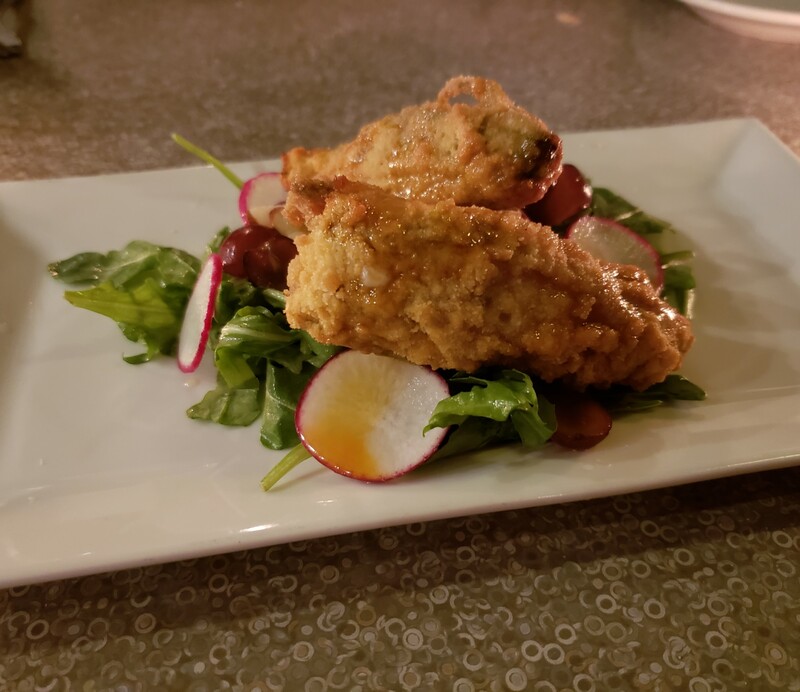 Our appetizer: fried summer squash blossoms, an item we’d seen previously only on Chopped. A seasonal item, not too oily and mercifully not served in five-pound portions or else I would’ve filled up on them. 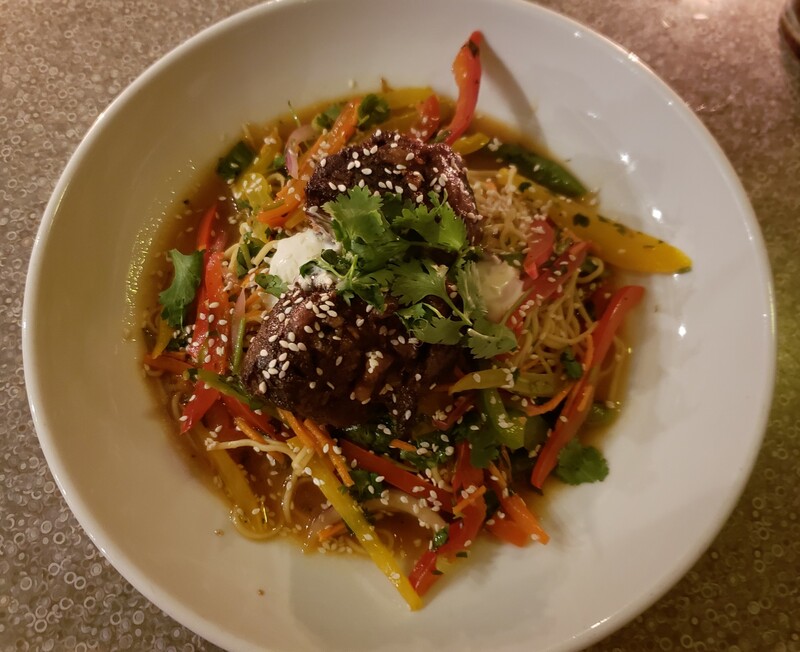 My dinner of choice was in our lead photo, the decidedly not-Italian Thai beef short ribs — topped with ginger, soy, and lime crema, served with angel hair pasta tossed with sweet bell pepper and chili-lime vinaigrette. Suffice it to say I was in a funny mood, but appreciated the tasty creativity. 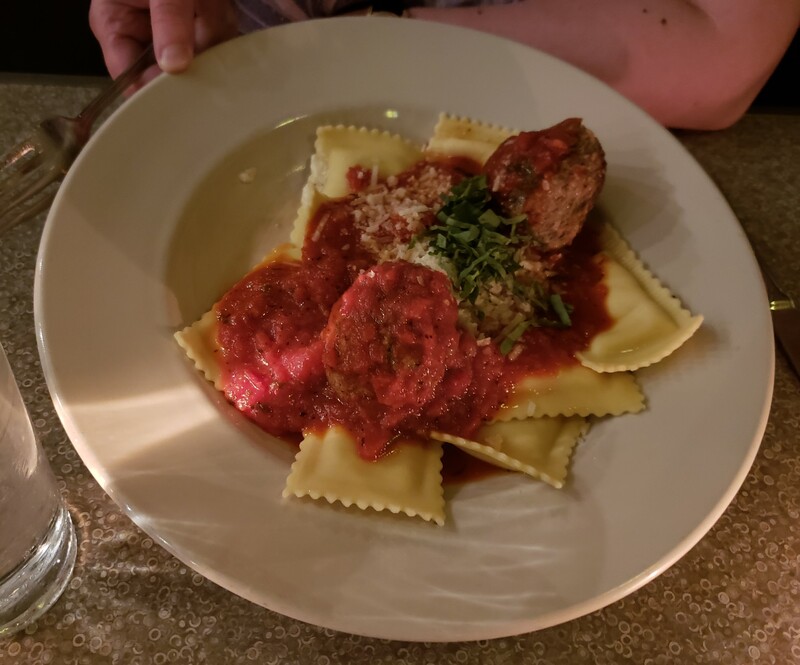 Anne opted more simply for cheese ravioli because sometimes she and I decompress after long days in very different ways. Service seemed slow at times, but that may have been our exhaustion talking, as well as our desire to return to the hotel and our disinterest in living Syracuse After Dark, without knowing whether or not the blocks beyond Armory Square had a reputation. The return journey was calm, bordering on dull except a few key places that looked as if they might be enjoyable when they’re open. 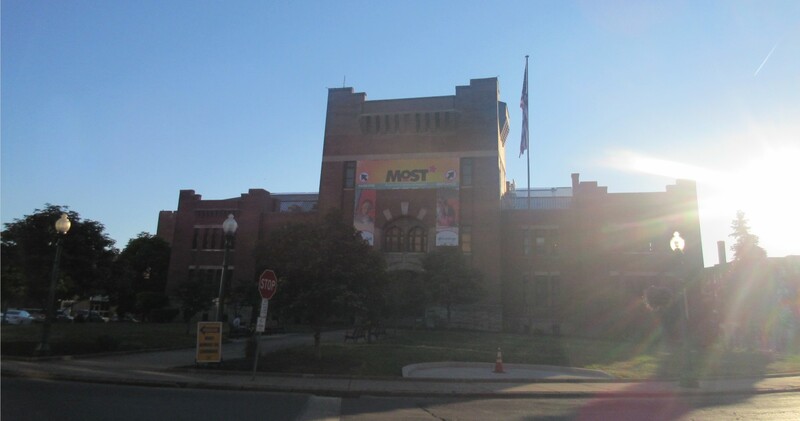 The largest feature around: the Milton J. Rubenstein Museum of Science and Technology, a.k.a. “the MOST”. 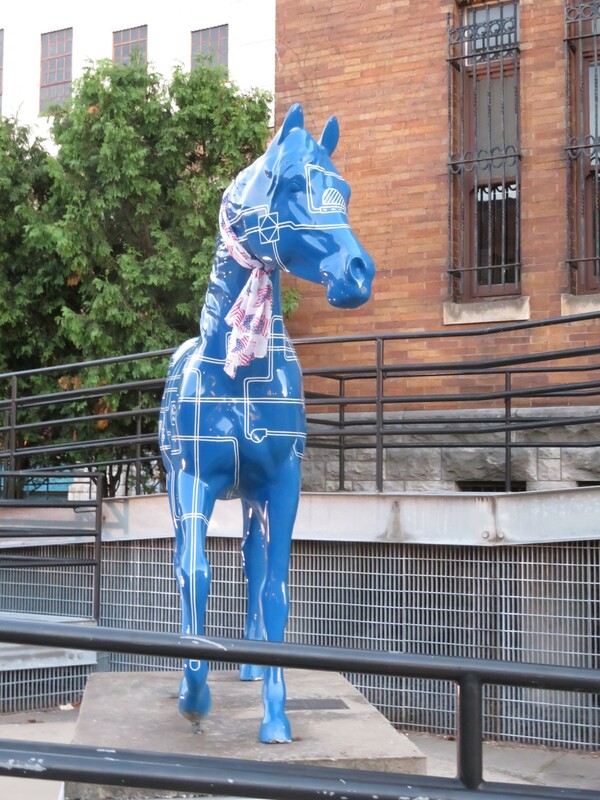 An artsy horsey outside the MOST, still wearing a Fourth of July bandanna. 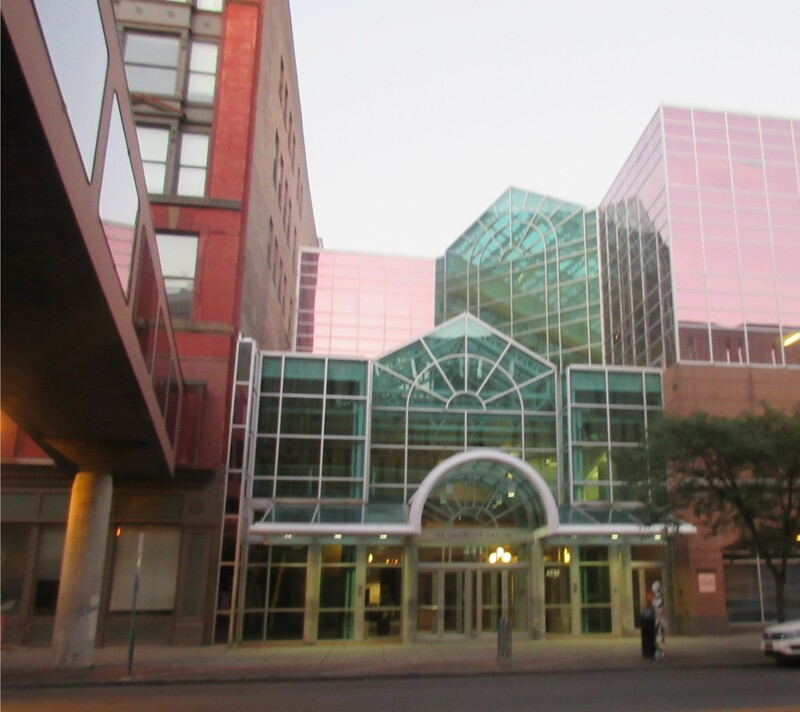 The award for niftiest structure, architecturally speaking, goes to the Galleries of Syracuse, a facility of mixed uses, all of them closed Sundays. Later back at the hotel, the wedding party had relocated inside a main ballroom, leaving the lobby as empty as the streets apart from security guards. 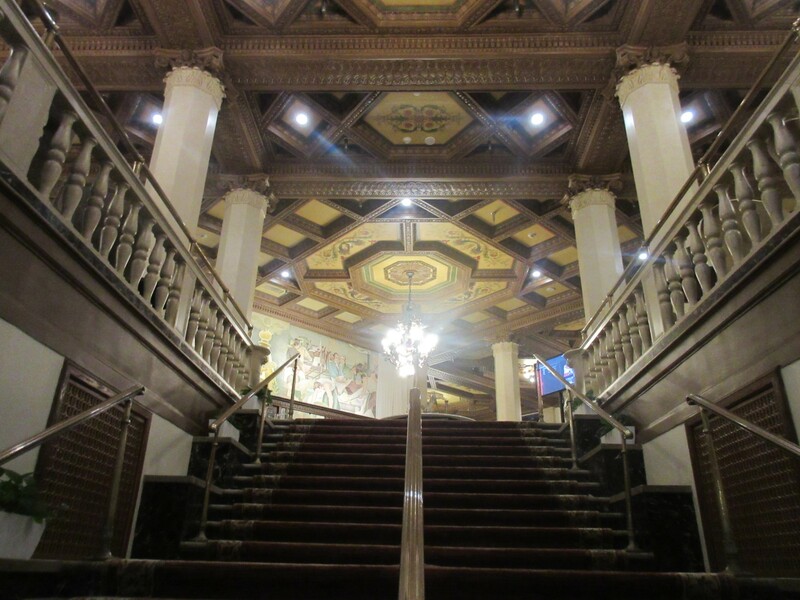 We could hear much music and dancing and delight pouring through the ballroom doors as we headed toward the elevators and put Day Two and ourselves to bed at last. Our hotel really wasn’t the sort of place that the painters of ‘LIVES CHANGE HERE” had in mind, but we hope it’s the case nonetheless for those blissful newlyweds.